A truck became engulfed after a crash on Route 173 in Antioch Monday morning. 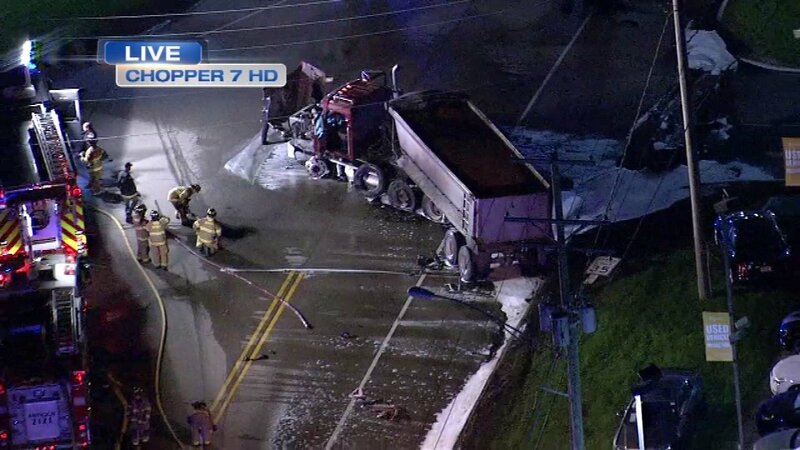 ANTIOCH, Ill. (WLS) -- Lanes on Route 173 in Antioch have reopened after a semi-truck caught fire after following a crash with an SUV Monday morning. The semi-truck collided with the SUV head-on on Route 173 at McMillen Road at about 5:30 a.m., with lanes in both directions closed for nearly four hours, Illinois State Police said. The SUV was driven by a 33-year-old man from Richmond and left its lane, striking the truck, police said. The truck was carrying 46,000 pounds of sand. The driver of the truck, a 36-year-old man from Houston, was transported to Advocate Condell Hospital, police said. Several explosions could be heard from the incident and cars parked at a nearby dealership were damaged by the head, police said. The driver of the SUV was cited for improper lane usage and unlawful use of an electronic communication device.